Karlie Almaraz cherishes the three biggest days in her life – the birth of her three-year—old daughter, Evelyn, her wedding to husband, Ayracon, and the day she got her dream boat. “I was just so in love because it was so perfect for what I needed,” Karlie said of the day she got a fishing kayak for her 22nd birthday. “My brother and I had done a lot of research, stumbled across fishing kayaks and it was just so perfect for me.” Karlie lacked the space, time or money for upkeep on a traditional fishing boat. Even though the small-framed 27 year old has to carry and wrestle the boat a bit, she said it’s worth it all. 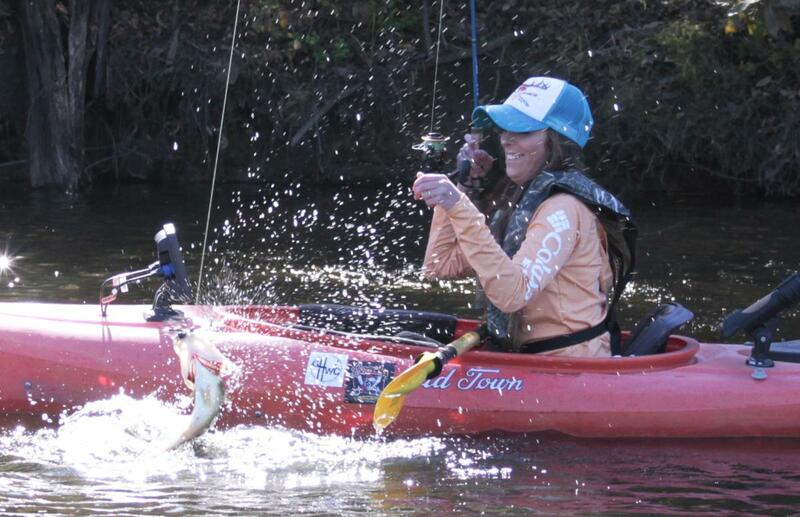 Karlie said she’s enjoyed transforming her kayak from a “blank canvas” to her perfect fishing craft. First came rod holders, she’s also added tackle assortments and ways to keep things attached and fairly dry. Her most recent “game changer” has been depth finder. Large and smallmouth bass are some of Karlie’s primary targets. They’re some of the most common fish in the county and community lakes as part of the Kansas Department of Wildlife, Parks and Tourism’s Community Fishing Assistance Program, where Karlie often fishes. Karlie has fished from her kayak on everything from small ponds to huge Tuttle Creek Reservoir. It’s the second largest in Kansas, and where Karlie some days caught double-digit numbers of walleye from her kayak. Now living in Spring Hill, a little south of the Kansas City area, Karlie heads to Hillsdale Reservoir when she wants to fish big water. She’s a huge fan of fishing city and community lakes. Several are very close. Because her kayak is so portable and easy to launch, she can be casting within a few minutes. As much as she relishes quiet times fishing by herself, Karlie’s quick to let others come along. She often borrows a kayak for them to use. Karlie’s extremely excited about the prospects of introducing someone extra-special to kayak fishing – her 3 ½ -year-old daughter, Evelyn. 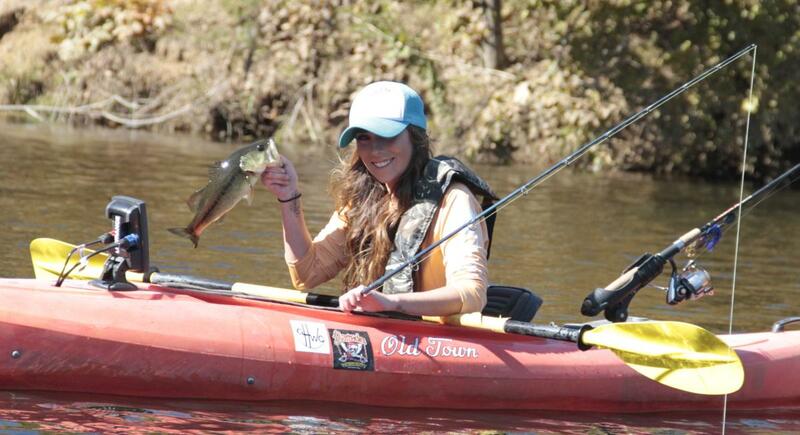 If she’s at all like her mother, little Evelyn will positively love kayak fishing.